Tis the season to shake things up! The chefs learn that as an added challenge, their dishes must have a holiday theme. In the appetizer round, the first opportunity to see who's got game, they get venison. And a heated debate ensues over a borrowed blender. Then, in the entree round, marshmallows don't marry well with the huge surprise in the mystery basket. And in the dessert round the remaining chefs "say cheese", but will they be smiling when their final festive dishes take shape? Find out what the judges have to say after Jon's mistake with the blender. 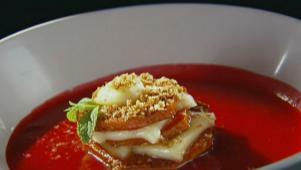 The chefs make holiday desserts with yams, brie, wine and cranberries.